Although T-Mobile says it won’t raise prices for three years, Rep. Frank Pallone, D-N.J., chairman of the House Energy and Commerce Committee, said he isn’t sure that Trump administration regulators are willing to hold T-Mobile to that promise. 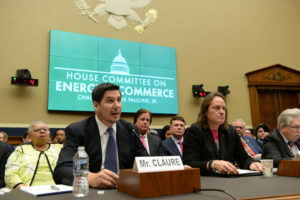 “How can we be sure that consumers who can least afford to pay more are not harmed by the merger?” Pallone asked at a House subcommittee hearing Wednesday. The deal would combine the nation’s third- and fourth-largest wireless companies and create a behemoth roughly the size of industry giants Verizon and AT&T. Congress doesn’t have authority to rule on the merger, but members are able to use the forum to ask pointed questions. Now that Democrats control the House, they have convened its first merger-review hearing in eight years. Complicating their argument is the fact that urban consumers are paying 22 percent less for cellphone service following AT&T’s failed bid to acquire T-Mobile in 2011, a combination rejected by federal regulators as anticompetitive. That data comes from the Bureau of Labor Statistics price index for wireless telephone service.